As a dreamer, you automatically have a certain zest for life and all it has to offer because you dream about all of the great things that could be. The problem becomes the comparison between what you dream about and your reality. It’s too easy to feel disappointed at where you are and what you have in the glaring light of where you want to be. Dreaming of living on a beach can make your city apartment, no matter how nice it is, feel like a brick and mortar prison. It’s funny to me that dreams, in and of themselves, are considered to be a good thing – while being considered “a dreamer” is a negative thing. 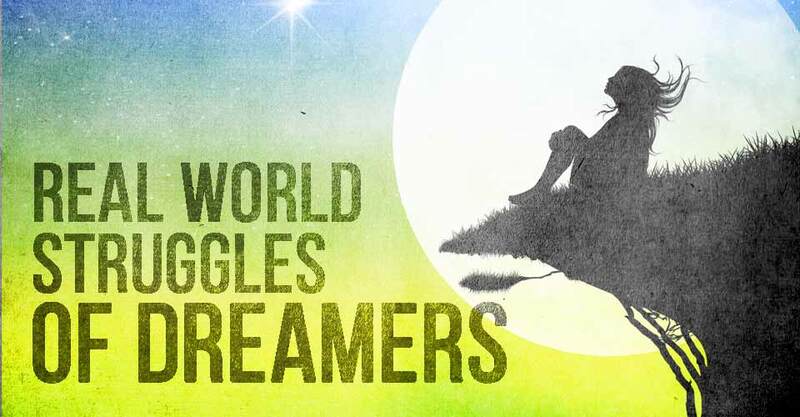 People perceive dreamers as people who spend their days wishing away at life, instead of making things happen. That can actually be true to an extent. Depending on the potential reality of your dreams, wrapping your mind up in something like going back in time to change your future can be counter-productive. On the other hand, dreaming about a better job can be just the fuel you need to move forward. So, let’s say that your dreams are all pretty reasonable. The more you focus on those dreams, the more life can feel like it is ticking away a second at a time without you moving toward your dreams. Every day you spend working a job you don’t like instead of painting or writing for a living, feels like another day walking away from what you really want to do. You can feel stifled by the responsibilities that you’ve built around yourself. Doing what you have to do instead of what you want to do can make life a task. Again, let’s say your dream is to live on the beach, but it seems like an impossible fairy tale. It’s not only harder to do the things you need to do to make your dream a reality, it can become hard to live the life you have because it’s not what you want. Just keep in mind, dreaming big means working hard to accomplish those dreams. Hard work isn’t impossible, but it is exhausting. So, from one dreamer to another let me just say this: NEVER stop dreaming. Our nature to dream is what makes us unique. Let your imagination run wild, with the understanding that there are dreams in your life that you can achieve. We hear stories all the time of people who’ve taken those flying leaps into the unknown and landed in places they’d only thought were possible. Between faith and enthusiasm, there is nearly nothing that you cannot do.